Thank you. Phew, glad you didn't say horrible. ^^ I had a lot of people tell me it still looks to long and her heels are rundown. I think I agree with the run down and may take a bit more off the toe. I'm leaving her heels alone for now so they can get a bit longer. I relooked and this early in the morning I can't tell my left from right. Actually, the left is a little long. I think you need to take a ruler and measure her feet and see if they match. I always thought about how it would feel having to walk around in shoes with one heel 1" and one heel 2". Being uneven wouldn't be comfortable. Having said that, I think it's wonderful that you're being bold, proactive and learning how to do your horse's feet!!! It looks like a nice a tidy trim, but you are battling one of the hardest pathologies to remediate....flare forward. The trim needs to be more proactive, though. The old growth at the ground at the toe is still so far out there that its pulling on the tighter new growth coming down the hoof, so the new growth isn't tight either. By the length of the pulled new growth, I'd say you haven't made any headway for six months on this, sorry. The toe way out there is also pulling on the heels, which are getting run under. They are good length. If you let these heels grow, the toe will continue to pull them under and then you won't have any heel to work with anymore, so that's not the right answer. Your heels are a nice length right now. Nice for a confident heel first landing. So you just tweak the heels and keep them confident while you bring back the toe and get the pull off of everything. When the pull is off, the heels will start to straighten up. Once you apply the bevel correctly, you'll see a difference in her movement as soon as you leave the trimming area. She'll stop lifting her knees higher to get that toe to clear the ground and will adopt a more sweeping motion with a heel first landing. Horses are stoic. If they show weakness, they are predator food. She cares alright. If you had a long finger nail and put your finger on the floor and bent it backwards and put all your weight on it...that's what it feels like to her. Every time she breaks over to take that foot off the ground, the toe wedge bends backwards, pulls some more, stretches the white line and P3's nose comes down lower in the hoof. Flare hurts. I took a 3" toe wedge off a horse once, set her foot down and her sinuses started draining like crazy. It took a whole kleenex box to control the flood of mucus and she didn't sneeze, but got scared with the suddeness in it. Her eyes lost the puffiness that she had before we started, right in front of us. You better believe she cares. There's a heart in each hoof and its health affects every system in her body. Make no mistake. The left foot is actually the worst foot and its also longer than the other, so you can take the path of pathology and extend it past her knees and go right on up to uneven withers and the need for a chiropractor. So, something needs to be done about this hoof to help it, possibly avoiding the chiro. If you can post more pics, I can draw lines on them to show you what you need to do. The goal is to get the hoof capsule tight to the bone, so that they work as one together. You're doing a good job. Just need to tweak the angles and get the function so that she can get move properly and get her own ducks in order. If you care to post pics, I will show you and explain. Takes me hours and won't cost you a cent. Just wish to help and have been doing this for years. You'll be able to draw those lines right on the hoof (until you can see them without the lines) and arrive. I'm only as good as your pics, though. Its gotta make sense to you, or you can leave me behind. No problem, just trying to help. a) Front shot: 4'out in front of the horse, camera on the ground, both feet standing square and catch up to the knees. Don't angle the camera upwards, keep it flat on the ground. 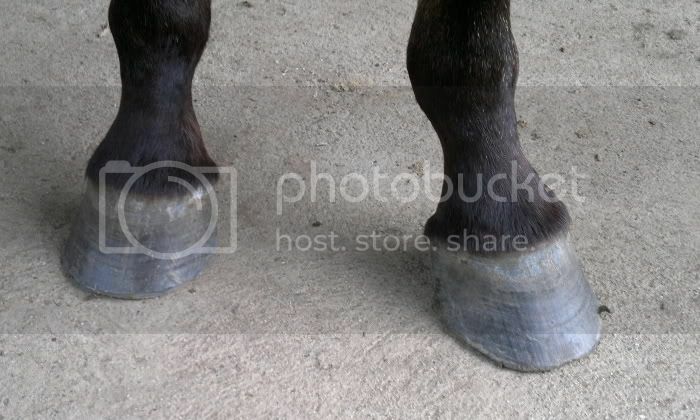 b) Heel Shot: Lift the hoof, hold only by cupping the front of the pastern and let hoof hang. Lean forward, but a good 2' distance and catch part of the cannon, the heels, the apex of the frog and the toe in the background, so not too severe an angle. I need to see the whole bottom of the hoof. This one is important. This one allows me to show you exactly what you are seeing when you pick up the hoof. Let's do 4 of these, one for each hoof and get her all squared away. 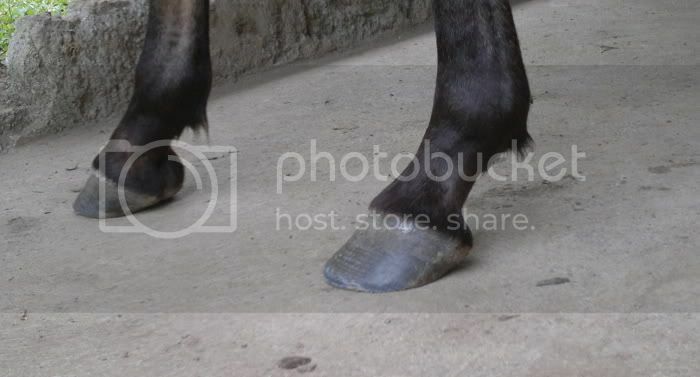 c) Side shot: One of each hoof, from the outside, 4' away and camera on the ground again, centered between heel and toe. d)Solar/side shot: Lift hoof and re-position yourself so you are facing in towards her leg. Get parallel to the bottom of the hoof, then lift up a bit higher to be able to see the bottom of the hoof and the depth of the groove. e) Solar Shot: Pick up hoof and get directly above (2'away) the bottom of the hoof and centered a 1/2" behind the apex of the frog. Missy, you could put one space between your paragraphs (hit enter twice) and it keeps it separated. SO glad you posted. Great stuff as usual! by the way, Missy, have you followed this young lady? She's a nursing student in the Phillipines and has very little support with her horses. She's amazing. I'm so glad you're helping her!! I fixed it for you. I hope I got the paragraphs the way you wanted. Aw, thanks so much guys for fixing my post. I did leave a double space but next time I will leave even more. My long post would have been a trial to read for sure! I will think of it as leaving more space for my new friends, lol. No, I've not been following, or know the history of the OP. I do hope she comes back and lets me help. If support is hard to find, then knowledge that helps her help her horse, is exactly what she needs. Is there somewhere I should go to read and catch up? I left two spaces between the paragraphs the first time, left three spaces between this one that has 2 paragraphs and then edited to 4 spaces and it still muddled together. I must still be doing something wrong. Cintillate has some really cute stuff in the Video and Pictures section. She was a member a long time ago. I forget the name she used. I think it was one of her horses. She's fiesty! [ ] A real sweetheart!! I want to say she's spent some time living in the States. Maybe Arizona?? Where are ya Cin?? Sorry I haven't been on in a while. It was final exam week and final week for my LAST days as a nursing student. By the way I passed and will graduate NEXT WEEK. I really really appreciate your response. You have no idea what it is like not to just be able to just go to a farrier. There just isn't one, that I know of. People here just do their horses hooves themselves I doubt anyone has been to a farrier school. Most people don't understand that. I wonder if this has been a long term problem that I just didn't notice because she doesn't show any signs of pain and runs like a lunatic whenever. I have a picture of the first time I got her. I think her back hooves were better than they were now.This was her last yearhttp://i1236.photobucket.com/albums/ff457/cintillate/Horses/may.jpg this is her last weekhttp://i1236.photobucket.com/albums/ff457/cintillate/Horses/now.jpg I will definitely get more pictures as soon as possible. Will have to read your post again. I got the general idea but have to take in and understand everything before I do something. Haha farrier nurse? You were right, I did live in Arizona until I was 12 years old. I think I came on the forum when I was 14-15? Sorry, cant edit my previous post to add this. I get a lot of errors if I try. Wanted to ask if how much should I do at a time. I don't want to do too much to fast or go too slow. I want to take quite a bit off the toe.